On 26th day of the Second Month, 2136 (April 22, 2009), Kyabje Ugyen Tenzin Jigme Lhundrup Rinpoche, the reincarnation of His Holiness Dilgo Khyentse Rinpoche, visited Namdroling Monastery accompanied by Kyabje Shechen Rabjam Rinpoche, along with Gyalse Tulku Rinpoche, Jangling Tulku Rinpoche and Tulku Kunga Rinpoche, to pay their respects and perform prayers before His Holiness Penor Rinpoche’s Holy Body (Kudung). 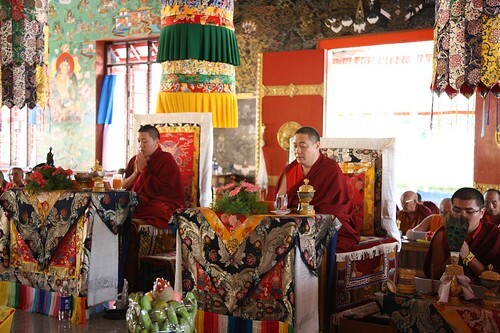 A Sertreng Ceremony, consisting of a line of Namdroling Monastery monks and nuns that included the Three Heart Sons, tulkus, khenpos, and lamas was formed at the gate of the monastery and proceeded to the residence of Gyangkhang Tulku Rinpoche, which is where the visiting Rinpoches had been invited to stay during their visit. In honor of their visit, the Gyaling were sounded and fragrant incense was burned at their arrival, and all the faculty of Namdroling Monastery followed HH Karma Kuchen Rinpoche, the Twelfth Throneholder of Palyul Monastery, in offerings of khata to the visiting dignitaries, who were also welcomed with desi (the traditional sweetened saffron rice) and butter tea. Early the next day the visiting Rinpoches went to Zangdog Palri Temple to pay their respects to His Holiness Penor Rinpoche’s Kudung. At the temple, Kyabje Khyentse Yangsi Rinpoche and Kyabje Shechen Rabjam Rinpoche presided over the monks of Namdroling as they carried out a special one-day puja based on a Vajrasattva practice from the Minling Tradition, and the Lama Puja according to the Namcho Cycle. Later in the day, on behalf of the Namdroling sangha, Kyabje Karma Kuchen Rinpoche along with Mugsang Kuchen Rinpoche offered the two high lamas mandalas of body, speech and mind, as well as khata, monetary and other offerings as tokens of gratitude for their visit to the monastery. Offerings of gratitude were also presented to Gyalse Tulku, Jangling Tulku and Tulku Kunga, along with their attendants. The puja concluded at 5 pm with the prayers of aspiration and dedication. The visiting Rinpoches returned to Shechen Monastery in Nepal early in the morning of the following day.